Bookkeeping Services, and much more! The April 15 tax deadline is MONDAY!!! Due to the difficult nature of the new tax law and the extra time required to prepare your 2018 tax returns, the deadline for clients to drop off data for the firm to file an extension on their behalf is this Saturday, April 13 at noon. If you are unable to make the deadline, you can file your extension online at https://www.irs.gov/ and https://revenue.louisiana.gov/ or download blank Federal and LA extension forms from our "Important Documents" website page to be filled out and mailed in by April 15 and May 15, respectively. We recommend that you send both by April 15. We will be happy to assist you with the completion of your tax return at a later date if you choose to file your own extension. Please retain a copy of the extension to provide to us for reference. We are pleased to announce a new and exciting change that takes place effective 1/1/19. 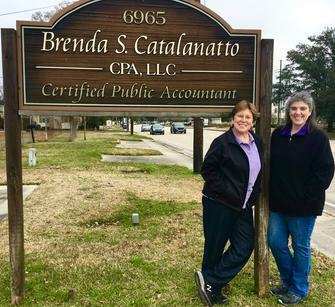 Tami Barnes, CPA has officially partnered with Brenda. Tami joined the firm in July of 2015. Many of our clients already know Tami and have been working with her over the past few years. Brenda S. Catalanatto, CPA, LLC. The new Tax Cuts and Jobs Act (TCJA) has redefined what will be considered a business deduction. See the chart below to know what to expect for this tax season. As you all know, there was a massive tax reform bill passed at the end of 2017. One of the big changes included in this bill was something called the Qualified Business Income Deduction. This deduction can allow a taxpayer to receive a deduction of up to 20% of Qualified Business Income. (Example: your business makes a profit of $100k. You would be able to reduce the $100k by $20k and only pay taxes on $80k). However, this is a very complicated new law and one of the many questions has been as to whether or not rental real estate qualifies for this deduction. 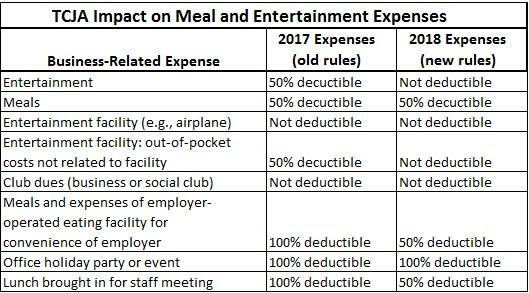 We have been waiting on further guidance from the IRS as to how the deduction is calculated and what businesses would qualify for this deduction. On January 18, 2019, the IRS issued further guidance on this subject in the form of a 247 page document. It has finally been clarified that the deduction will be allowed for those with rental properties. However, the IRS has stated that taxpayers who want to treat rental activity as a trade or business for the purpose of receiving this deduction must also comply with the Form 1099 information reporting requirement. What this means to you is that if you are interested in taking this new deduction, you must issue Form 1099-Misc forms to any person or business that you paid over $600 for services. 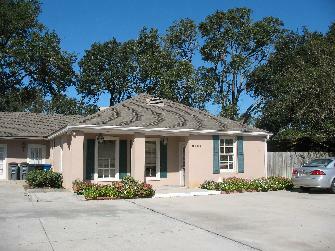 This would include any repairs, maintenance, management fees or lawn care, just to name a few. Please contact our office if you have any questions or if you need assistance in preparing and issuing the Forms 1099-Misc and the 1096 transmittal form. The deadline is January 31, 2019 so time is of the essence. Any 1099-Misc forms issued after January 31, 2019 are subject to penalties. DO YOU OWN A BUSINESS? DID YOU PAY A SPECIFIC VENDOR FOR SERVICES OR RENT IN THE AMOUNT OF $600 OR MORE IN 2018? IF SO, YOU NEED TO PROVIDE THE VENDOR OR RENTAL COMPANY A 1099misc. THE IRS WILL ISSUE STEEP PENALTIES FOR FAILING TO PROVIDE A 1099misc WHEN REQUIRED. PENALTIES RANGE FROM $50 PER 1099misc TO $186,000 PER 1099misc form. THE PENALTIES INCREASE BASED ON THE DATE THE FORM IS FILED. IT IS ALSO IMPORTANT TO FILE THESE FORMS WITH THE CORRECT TAXPAYER INFORMATION. PENALTIES APPLY WHEN THE CORRECT INFORMATION IS NOT PROVIDED TO THE IRS. Click on our "Useful Links" tab for easy access to important tax related websites. It's an easy way to learn about various tax agencies as well as the Affordable Healthcare Act. Feel free to contact us with any questions you may have relating to these topics. We would love to hear from you!